The Future Is Bright! This young children’s album is a culmination of our hopes and dreams for the next generation. Music for the world we need, and a vaccination against bigotry and hatred. The Tao Te Ching says, “Sow the great in the small. Difficult things of the world are best tackled in their small beginnings.” Research shows us that prejudice forms very early on (before age 3!) but that we can interrupt that prejudice when we talk in our homes and classrooms about race, celebrating our differences, about fairness, self-love, caring, and sharing with all people. This album is a musical love letter to the world we need. May it spread Love, justice, freedom, hope, virtue, peace, and gratitude. Thank you for supporting our work and supporting the children. Fifty percent of album sales will go towards organizations working on equitable access to education, children’s advocacy, and anti-racist education. An engaging, developmentally appropriate assembly to build community, hope, equity, and belonging for preschool-3rd grade students. With this highly participatory performance we use a collection of our children's songs to engage our youngest learners to celebrate the ways in which we are all both similar and different. We name the fact that some of the differences between us carry very different weights, and people in our world and our country have not always been - and still are not always - treated fairly based on differences like the color of our skin, our gender, religion, who we love, and more. Students share out what it looks like to be an upstander, and we discuss how even if many grownups and kids in our country are still learning how to be kind, safe and fair to all people, we can set an example for the world in our classrooms. 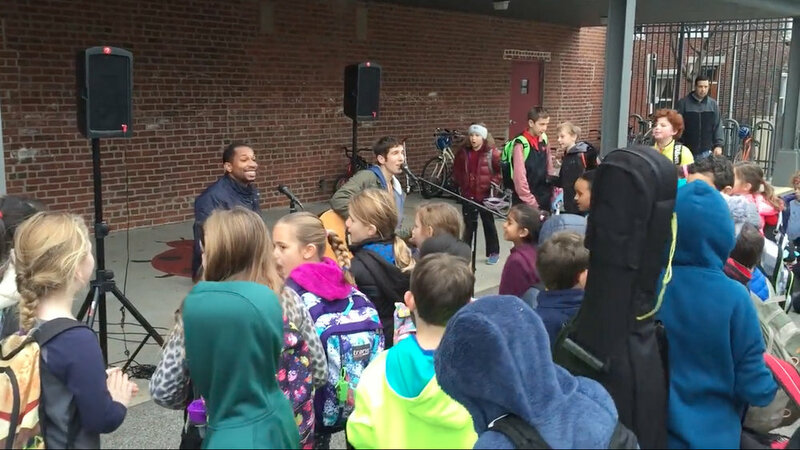 We are exited to partner with your school or organization to offer family concerts as community gatherings or fundraisers. A family concert using our songs is a meaningful chance to give entire families a deep shared experience, shared language, narratives and theme songs to open discussions about race, celebrating our differences, self-love, fairness, caring and sharing. We have found that this builds cohesive community around positive change, inclusion, equity and justice among school families. We also partner with schools and organizations at family events to sell our CDs on a sliding scale of $5-20 with fifty percent of proceeds going to support your school or organization’s work around accessibility and/or anti-oppression professional development opportunities. Please contact us to discuss how we can best partner with you for your family event.